the result was Transarc DFS, part of the distributed computing environment (DCE) from the OSF organization. In 2000, IBM's Transarc Lab announced that AFS would be an open-source product (termed OpenAFS) available under the IBM public license and Transarc DFS was canceled as a commercial product. 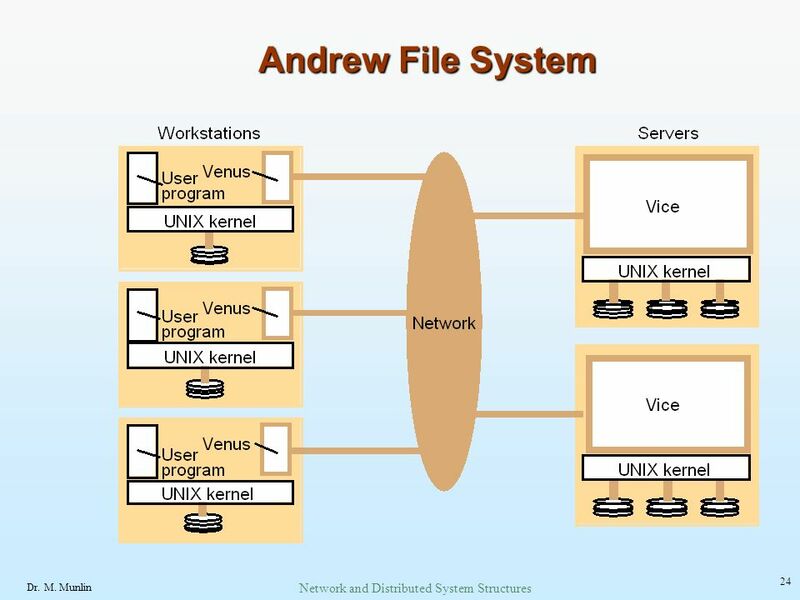 OpenAFS is available under most commercial versions of UNIX as well as Linux and Microsoft Windows systems.
. One of the most formidable attributes of AFS is scalability: The Andrew system is targeted to span over 5,000 workstations. Between AFS and Transarc DFS, there are hundreds of implementations worldwide. AFS distinguishes between client machines (sometimes referred to as workstations) and dedicated server machines. Servers and clients originally ran only 4.2 BSD UNIX, but AFS has been ported to many operating systems. The clients and servers are interconnected by a network of LANs or WANs. Clients are presented with a partitioned space of file names: a local name space and a shared name space. Dedicated servers, collectively called Vice after the name of the software they run, present the shared name space to the clients as a homogeneous, identical, and location-transparent file hierarchy. The local name space is the root file system of a workstation, from which the shared name space descends. Workstations run the Virtue protocol to communicate with Vice, and each is required to have a local disk where it stores its local name space. Servers collectively are responsible for the storage and management of the shared name space. The local name space is small, is distinct for each workstation, and contains system programs essential for autonomous operation and better performance. Also local are temporary files and files that the workstation owner, for privacy reasons, explicitly wants to store locally. Viewed at a finer granularity, clients and servers are structured in clusters interconnected by a WAN. Each cluster consists of a collection of workstations on a LAN and a representative of Vice called a cluster server, and each cluster is connected to the WAN by a router. • Client mobility. Clients are able to access any file in the shared name space from any workstation. A client may notice some initial performance degradation due to the caching of files when accessing files from a workstation other than the usual one. • Security. The Vice interface is considered the boundary of trustworthiness, because no client programs are executed on Vice machines. Authentication and secure-transmission functions are provided as part of a connectionbased communication package based on the RPC paradigm. After mutual 656 Chapter 17 Distributed File Systems authentication, a Vice server and a client communicate via encrypted messages. Encryption is performed by hardware devices or (more slowly) in software. Information about clients and groups is stored in a protection database replicated at each server. • Protection. AFS provides access lists for protecting directories and the regular UNIX bits for file protection. The access list may contain information about those users allowed to access a directory, as well as information about those users not allowed to access it. Thus, it is simple to specify that everyone except, say, Jim can access a directory. AFS supports the access types read, write, lookup, insert, administer, lock, and delete. • Heterogeneity. Defining a clear interface to Vice is a key for integration of diverse workstation hardware and operating systems. So that heterogeneity is facilitated, some files in the local /bin directory are symbolic links pointing to machine-specific executable files residing in Vice. AFS's shared name space is made up of component units called volumes. The volumes are unusually small component units. Typically, they are associated with the files of a single client. Few volumes reside within a single disk partition, and they may grow (up to a quota) and shrink in size. Conceptually, volumes are glued together by a mechanism similar to the UNIX mount mechanism. However, the granularity difference is significant, since in UNIX only an entire disk partition (containing a file system) canbe mounted. Volumes are a key administrative unit and play a vital role in identifying and locating an individual file. A Vice file or directory is identified by a low-level identifier called a fid. Each AFS directory entry maps a path-name component to a fid. A fid is 96 bits long and has three equal-length components: a volume number, a vnode number, and a iiniquifier. The vnode number is used as an index into an array containing the modes of files in a single volume. The uniquifier allows reuse of vnode numbers, thereby keeping certain data structures compact. Fids are location transparent; therefore, file movements from server to server do not invalidate cached directory contents. Location information is kept on a volume basis in a volume-location database replicated on each server. A client can identify the location of every volume in the system by querying this database. The aggregation of files into volumes makes it possible to keep the location database at a manageable size. To balance the available disk space and utilization of servers, volumes need to be migrated among disk partitions and servers. When a volume is shipped to its new location, its original server is left with temporary forwarding information, so that the location database does not need to be updated synchronously. While the volume is being transferred, the original server can still handle updates, which are shipped later to the new server. At some point, the volume is briefly disabled so that the recent modifications can be processed; then, the new volume becomes available again at the new site. The volume-movement operation is atomic; if either server crashes, the operation is aborted. 17.6 An Example: AFS 657 Read-only replication at the granularity of an entire volume is supported for system-executable files and for seldom-updated files in the upper levels of the Vice name space. The volume-location database specifies the server containing the only read-write copy of a volume and a list of read-only replication sites. The fundamental architectural principle in AFS is the caching of entire files from servers. Accordingly, a client workstation interacts with Vice servers only during opening and closing of files, and even this interaction is not always necessary. Reading and writing files do not cause remote interaction (in contrast to the remote-service method). This key distinction has far-reaching ramifications for performance, as well as for semantics of file operations. The operating system on each workstation intercepts file-system calls and forwards them to a client-level process on that workstation. This process, called Venus, caches files from Vice when they are opened and stores modified copies of files back on the servers from which they came when they are closed. Venus may contact Vice only when a file is opened or closed; reading and writing of individual bytes of a file are performed directly on the cached copy and bypass Venus. As a result, writes at some sites are not visible immediately at other sites. Caching is further exploited for future opens of the cached file. Venus assumes that cached entries (files or directories) are valid unless notified otherwise. Therefore, Venus does not need to contact Vice on a file open to validate the cached copy. The mechanism to support this policy, called callback, dramatically reduces the number of cache-validation requests received by servers. It works as follows. When a client caches a file or a directory, the server updates its state information to record this caching. We say that the client has a callback on that file. The server notifies the client before allowing another client to modify the file. In such a case, we say that the server removes the callback on the file for the former client. A client can use a cached file for open purposes only when the file has a callback. If a client closes a file after modifying it, all other clients caching this file lose their callbacks. Therefore, when these clients open the file later, they have to get the new version from the server. Reading and writing bytes of a file are done directly by the kernel without Venus's intervention on the cached copy. Venus regains control when the file is closed. If the file has been modified locally, it updates the file on the appropriate server. Thus, the only occasions on which Venus contacts Vice servers are on opens of files that either are not in the cache or have had their callback revoked and on closes of locally modified files. Basically, AFS implements session semantics. The only exceptions are file operations other than the primitive read and write (such as protection changes at the directory level), which are visible everywhere on the network immediately after the operation completes. In spite of the callback mechanism, a small amount of cached validation traffic is still present, usually to replace callbacks lost because of machine or network failures. When a workstation is rebooted, Venus considers all cached 658 Chapter 17 Distributed File Systems files and directories suspect, and it generates a cache-validation request for the first use of each such entry. The callback mechanism forces each server to maintain callback information and each client to maintain validity information. If the amount of callback information maintained by a server is excessive, the server can break callbacks and reclaim some storage by unilaterally notifying clients and revoking the validity of their cached files. If the callback state maintained by Venus gets out of sync with the corresponding state maintained by the servers, some inconsistency may result. Venus also caches contents of directories and symbolic links, for pathname translation. Each component in the path name is fetched, and a callback is established for it if it is not already cached or if the client does not have a callback on it. Venus does lookups on the fetched directories locally, using fids. No requests are forwarded from one server to another. At the end of a path-name traversal, all the intermediate directories and the target file are in the cache with callbacks on them. Future open calls to this file will involve no network communication at all, unless a callback is broken on a component of the path name. The only exception to the caching policy is a modification to a directory that is made directly on the server responsible for that directory for reasons of integrity. The Vice interface has well-defined operations for such purposes. Venus reflects the changes in its cached copy to avoid re-fetching the directory. Client processes are interfaced to a UNIX kernel with the usual set of system calls. The kernel is modified slightly to detect references to Vice files in the relevant operations and to forward the requests to the client-level Venus process at the workstation. Venus carries out path-name translation component by component, as described above. It has a mapping cache that associates volumes to server locations in order to avoid server interrogation for an already known volume location. If a volume is not present in this cache, Venus contacts any server to which it already has a connection, requests the location information, and enters that information into the mapping cache. Unless Venus already has a connection to the server, it establishes a new connection. It then uses this connection to fetch the file or directory. Connection establishment is needed for authentication and security purposes. When a target file is found and cached, a copy is created on the local disk. Venus then returns to the kernel, which opens the cached copy and returns its handle to the client process. The UNIX file system is used as a low-level storage system for both AFS servers and clients. The client cache is a local directory on the workstation's disk. Within this directory are files whose names are placeholders for cache entries. Both Venus and server processes access UNIX files directly by the latter's modes to avoid the expensive path-name-to-inode translation routine (namei). Because the internal inode interface is not visible to client-level processes (both Venus and server processes are client-level processes), an appropriate set of additional system calls was added. DFS uses its own journaling file system to improve performance and reliability over UFS. 17.7 Summary 659 Venus manages two separate caches: one for status and the other for .data. It uses a simple least-recently-used (LRU) algorithm to keep each of them bounded in size. When a file is flushed from the cache, Venus notifies the appropriate server to remove the callback for this file. The status cache is kept in virtual memory to allow rapid servicing of stat() (file-status-returning) system calls. The data cache is resident on the local disk, but the UNIX I/O buffering mechanism does some caching of disk blocks in memory that is transparent to Venus. A single client-level process on each file server services all file requests from clients. This process uses a lightweight-process package with non-preemptible scheduling to service many client requests concurrently. The RFC package is integrated with the lightweight-process package, thereby allowing the file server to concurrently make or service one RPC per lightweight process. The RPC package is built on top of a low-level datagram abstraction. Whole-file transfer is implemented as a side effect of the RPC calls. One RPC connection exists per client, but there is no a priori binding of lightweight processes to these connections. Instead, a pool of lightweight processes services client requests on all connections. The use of a single multithreaded server process allows the caching of data structures needed to service requests. On the negative side, a crash of a single server process has the disastrous effect of paralyzing this particular server.